The Beovision 5100 was a cheaper, simpler version of the Beovision 5500. Constructed are around the same 33XX series chassis components, the Beovision 5100 had a simpler single loudspeaker (an open-backed elliptical “full range” unit), a less powerful audio amplifier (6W as opposed to 14W), no headphone socket, no automatic contrast control, no on-screen programme indicator, and only 8 (as opposed to 16) programme selections and simpler trim at the rear of the cabinet. Text copyright © Beocentral. Unauthorised reproduction prohibited. These omissions aside, the Beovision 5100 was essentially the same high quality set as the Beovision 5500. The same type of 30AX picture tube was used, along with many of the same circuit modules. The same Beovision Video Terminal remote control unit was also supplied, though assuming that the optional teletext decoder was not fitted the “9” and “0” keys had no function. Text copyright © Beocentral. Unauthorised reproduction prohibited. The Beovision 5100 introduced a new cabinet finish for this series of models. It could be ordered with a grey cabinet back moulded from impact resistant plastic. This cabinet finish was not available for any other set in this series. Text copyright © Beocentral. Unauthorised reproduction prohibited. 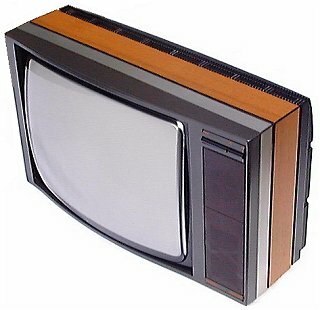 The Beovision 5100 was replaced in 1984 by the Beovision 5102. Text copyright © Beocentral. Unauthorised reproduction prohibited.